Thirty years of marriage to a soccer tragic means I have developed some interest in the game. And that interest was abundantly rewarded in last night’s nail bitingly tense final of the Asian Cup. Two teams of frighteningly fit and dedicated athletes gave their all to see who would win. And the Socceroos bought it home. Thank goodness or life here would have been morose for some time. My football tragic has always believed in Ange. Watching the post match analyses, as you do, made me reflect a little on what it means for me to be Australian. A stroke of luck rather than anything to do with wise decision making or careful birth plans on my part. I struggle with Australia Day celebrations. I struggled (read felt violently ill) even more this year when (apologies to any monarchists reading the blog) our PM knighted Prince Philip. (You have no idea what I really wanted to type but have restrained myself from typing in the interests of keeping this suitable for family reading). It made it a debacle. Listening to one of the Offsiders‘ commentators this morning was calming. He noted that the name of the Socceroos coach is Postecoglou, the captain is Jedinak, the scorer of the first goal was Luongo. Iraqi fans wore T-shirts acknowledging their heritage and their home. This is what makes Australia special for me. May we become a kinder, more welcoming, diverse, tolerant nation. May we elect a government that helps us to be that nation. 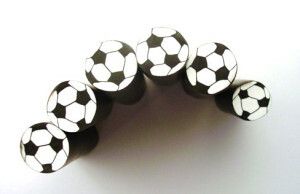 About the photos: The football cane was made by Toni Ransfield (of incredible pen fame) from her FlickR photo stream and the fan was taken by Stefan Postles and is from Gettyimages. This entry was posted in Uncategorized on February 1, 2015 by Managed WordPress Migration User.